If you use TextEdit on Mac for your simple word processing and quick plain text editing needs like a Notepad equivalent from the Windows world, you’ll likely appreciate that the latest versions of Mac OS support tabbed windows in TextEdit. 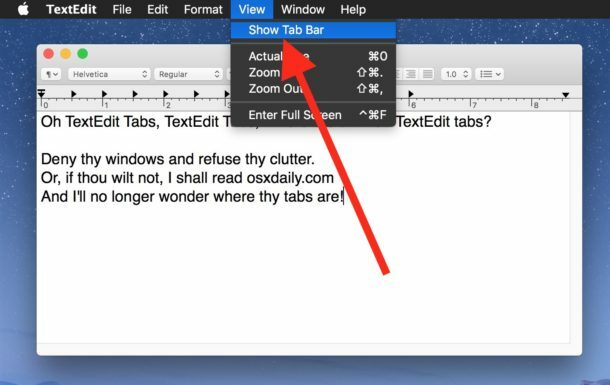 This can dramatically reduce window clutter in the TextEdit app, just like tabs work elsewhere. You may have noticed that tabs in TextEdit aren’t visible by default, so you’ll want to enable this little feature with a quick settings adjustment. 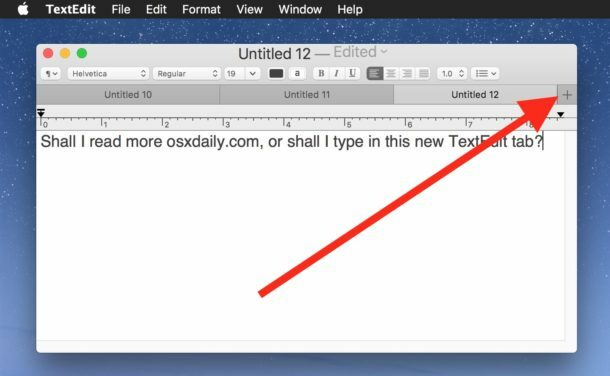 Why tabs are hidden by default in TextEdit isn’t entirely clear, but unlike in Safari where you can open a new tab with a keyboard shortcut, that isn’t (currently) an option in the MacOS TextEdit app. You’ll need a modern version of Mac OS Sierra or later to have this feature, older versions of Mac OS do not have tabbed support in TextEdit. Not everyone uses TextEdit but it’s an under appreciated app on the Mac. I personally use TextEdit all the time for quickly glancing at simple text documents, as a plain text viewer, basic word processing where the complete Pages functionality is not necessary, quick and dirty outlining, as a quick and simple HTML source viewer, and much more. For more full fledged word processing and text editing needs, I’ll rely on Pages app, Microsoft Word, and BBEdit or TextWrangler, but if you give TextEdit a try you might be surprised how fully featured it is for such a small lightweight application. Never gave it any thought, but it’s a time saver! TextEdit is one of the best Apple applications around, I use it all the time. thanks .. another useful tip which I wouldn’t otherwise have discovered! Didn’t see View/”Show Tab Bar” but Merge All got the thing rolling. Nice to know about. Love these little hidden gems! I too use TE as my daily “go-to” simple word processor of choice. RTF and TXT files are so under appreciated. cmd-option N creates a new empty tab. Ad far as I know there is no way to open an existing document in a tab but if the tab bar is visible, you can open an existing document then drag the tab bar to your other tabs. Also, if you are in full screen mode, documents will be opened in a new tab by default. One could do ctrl-cmd-F, cmd-O then ctrl-cmd-F to get out of full screen again. I have tried everything. I do NOT see the Show Tab Bar feature in the view dropdown. I have version 1.11. If i don’t how can i get the latest and greatest?